A couple of weeks ago whilst at work, I suddenly decided that I wanted to go back to uni and do a masters in September, and was adamant that I wanted to do this. When I woke up a day later, I realised that I did not want to go back to uni and do a masters, and that actually I had been having a freak out about the future. (I did the very same around this time last year). I think it's hard to transition into 'literally anything could happen in the future' after going through the education system for around 17 years of my life, where you knew that come the end of the academic year, you would simply be moving on to the next. This was not a guarantee when moving from GCSE's to A-Levels, and even less so when applying for universities and having to wait until the middle of August to know if you had 'got the grades' to get into the university of choice. Luckily, I managed to get into my first choice, but I remember the Christmas before being gifted lots of things for university which led me to having a meltdown in the evening. The uncertainty surrounding university, for me anyway, was more 'where will I be going' rather than 'will I be going'. After graduating that whole sense of security falls away into 'I need a job'. My previous role was temporary and fitted in really well as I knew that I wanted to apply for a graduate internship position at the university (and hooray that's what I'm currently doing!) but again this is only for a temporary period. Soon again that uncertainty will present itself, and after having a freak out about it, actually I've come to realise that it's okay. To freak out is okay. It's okay to be scared of the future but also to accept the uncertainty that it brings, and view it in a positive light. After freaking out about it, I've decided to 'roll with it'. Rolling with it has got me this far and I'm pretty happy with how things are going, so although it's scary, I'm looking forward to seeing what the future brings. As Valentine's Day is on Tuesday (which also happens to be my Nanna's birthday, so happy birthday in advance Nanna!) I think it's nice to give a nod to the day through your choice of make up, and so I thought I would share with you my top three nail varnish and lipstick/lipgloss choices for the day. These can cover a meal out to a night in depending on what you have planned! Tom and I do not really celebrate the day as it's so close to our anniversary, other than make each other a card and hope we get lucky on a scratchcard! This year we're also getting takeaway curry which I am super excited for. Essie 'Watermelon' - This is a bright pink colour, and is one that I'll be wearing on the day because I don't know about you, but all this dreary weather is a downer and I need some bright colours in my life! I really like the formula of the Essie nail varnishes; they're long lasting, and can be used in one layer or two depending on how deep a colour you want. Barry M Gelly 'Blood Orange' - Despite the name, this is your more 'classic red' for Valentine's Day. If you want to go for that love-heart red then this is the one for you! I find that the Gelly formulas only last for a few days but I love the shine that they give. 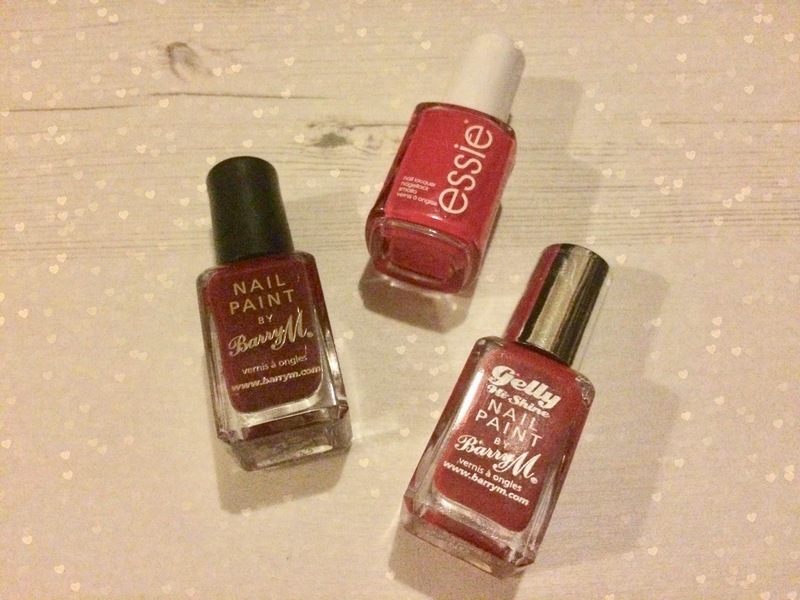 Barry M 'Raspberry' - This is more of a reddy purple colour, which is great for this time of year as we're still in the midst of winter and there's something about a dark red/purple that is cosy isn't there? The formula for this one still gives a shine (not as much as the Gelly's) and you definitely need two coats for the deep colour you see in the bottle. Mac 'Crosswires' - Crosswires is an orangey red, which like 'Watermelon' is a nod towards brighter colours and spring. As a cremesheen it's not massively pigmented but rather gives a shine to the lips like the rimmel lip butters do. This is great for during the day as it's not gapingly obvious when it starts to rub off and so you can either leave it or reapply throughout as you wish! Rimmel//Kate Moss '107' - This is a lovely deep red that will definitely need topping up throughout the day as you eat/drink! I love this lipstick and I've been wearing it since about September and it's still going strong into the winter. I'm not sure I would wear this in spring/summer so I'm definitely going to get a lot of use out of it now while I can! This lipstick starts off creamy but throughout the day becomes more matte. If you have a lip liner it would be good to use it with this. 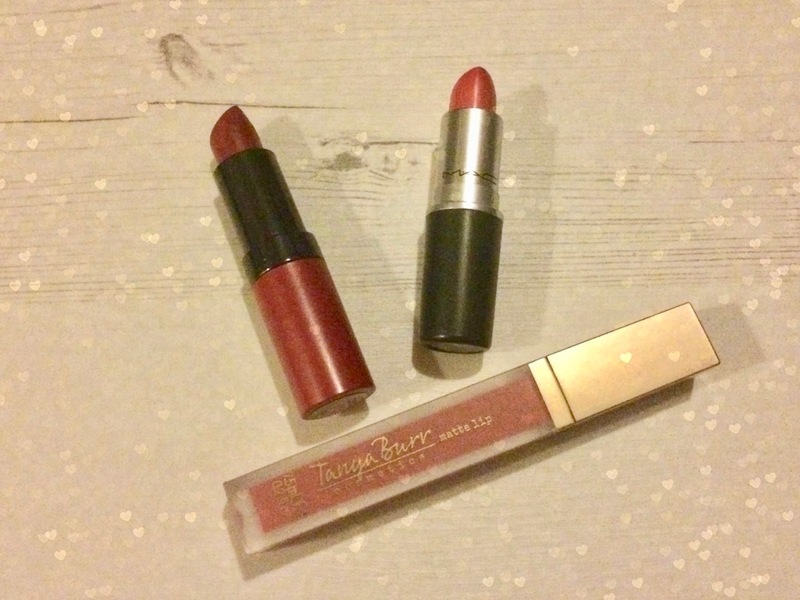 Tanya Burr Cosmetics 'Martha Moo' - This is a more natural lip and surprisingly pigmented as a gloss, and is one of those 'your lips but better' shades. You only need to put a thin layer on as otherwise you get that sticky residue as you do with all glosses, but this would go well with a dramatic smokey eye. I hope this has given you some inspiration for how you can celebrate Valentine's Day through your choice of nail varnish or lipstick/gloss on the day; I hope you have a lovely one with whatever you have planned!